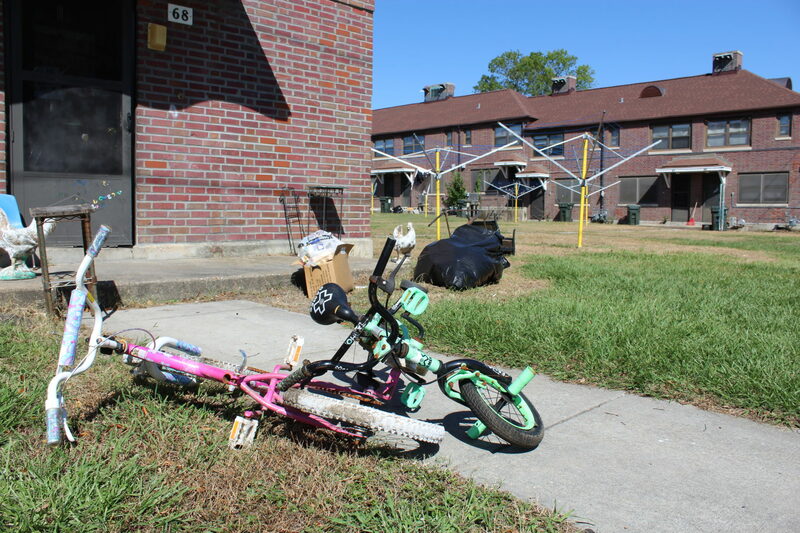 Kids’ bikes outside of a flooded part of Trent Court Housing Development. All photos by the author. Editor’s note: This story is part of a series examining the social and health injustices resulting from increasingly intense storms. It’s the result of a collaboration between Scalawag and Environmental Health News, a nonprofit publication dedicated to covering environmental health topics including climate change. Read part one here. Omisade Burney-Scott has white hair in skinny twists that wash forward on her head like a foaming wave, neat purple lipstick and eyeshadow. On a gloomy day in the fall, she wore a black shirt with white lettering on it: "Just a kid from New Bern." "It takes two seconds to find your cousins in New Bern," she said, laughing. Her 71-year-old sister, Mary Ann Dove, was among the people who rode out the catastrophic flooding in September. She knew Mary Ann wasn't planning to evacuate (because she had limited resources, and was under the impression that it was not going to be a catastrophic storm). But Burney-Scott got worried as news reports came in about the size of the storm surge from Florence, which made landfall as a Category 1 storm, then moved painfully slowly across the Southeast, dumping feet of rain. "I called her and I said, 'I need you to look outside and tell me what you see,'" she said. Mary Ann had fallen asleep on the couch watching the storm, and when she got up and went to the window, she cried out "Oh, my god." It looked "like a swimming pool" in her front yard. Mary Ann had fallen asleep on the couch watching the storm, and when she got up and went to the window, she cried out "Oh, my god." It looked "like a swimming pool" in her front yard. Burney-Scott called Craven County—where New Bern is located—emergency services, and hours later her sister, who doesn't know how to swim, was rescued by boat—along with her granddaughter and 6-year-old great-grandson. "When I came a week after the storm," Burney-Scott said, "that's the first time I saw her break down and cry." Mary Ann was and is terrified of drowning. The problems with displacement, slow FEMA payments, and lack of rental homes are well-documented, but residents like Burney-Scott's sister are left with longer-term problems. Staying healthy in the months after a flood presents a conundrum: People who stay at home may be living among rotting walls, exposed insulation, and black mold, as Mary Ann would if she stayed at home. "Trauma is a very personal experience," said Dr. Emanuela Taioli, MD, PhD, Director of the Institute for Translational Epidemiology at Mt. Sinai. She's worked on studies of Hurricane Sandy and Harvey survivors, and she says the trauma associated with witnessing a flood, fearing for your or your family's life, or being displaced from your home can have long-term effects. Being in a cramped shared space without support for a week or two compounds that, Taioli said. "A week is a lot of time to be in a situation where you share a bathroom with people you don't know." Burney-Scott, whose nickname in New Bern is Billie, is seeing these effects with her own eyes: She takes her glasses off when she starts to cry. Her sister is the eldest sibling and matriarch of the family, and sleeping on someone's couch was an alarming development. She can't even talk about the stress. "I'm scared this is the thing that's going to take her out," Burney-Scott said. She's worried about her sister's stress, anxiety, and tendency to be a caretaker even when she's the one who needs taking care of. She's also worried about the cough her sister has had since the storm—like a lot of people in New Bern, she's been spending time in buildings that were water-logged, and are now moldy. "She's so tired. She's used to bouncing back from really hard situations. She has built up what I would call a high level of toxic resiliency." The trouble with "toxic resiliency"
Burney-Scott was in New Bern for an event co-organized with New Bern native Dr. Ed Bell and Dawn Baldwin Gibson, local community organizers who have been concerned about the lasting effects of Hurricane Florence on New Bern's Black community. Dr. Brendan Hargett took the church podium in his slate gray suit, a salt and pepper beard and glasses. He said the first obstacle to treating trauma is recognizing it's there. "Sometimes our children are exposed to things that we as parents want to brush under the rug," he said, to nods and murmurs from the audience. "September was a rough month," he said. Yes indeed, yes it was, the crowd responded. He explained that trauma is a normal response to an abnormal event: When you experience a stressful event, the body releases stress hormones, which cause you to run, freeze, or fight. "All of these hormones are released into your body which signals you to do something in order to protect yourself." "It was more like a camp than a shelter. And there was no social support, none of the shelters had social workers, psychologists, no one who could help these people with the situation they were in," she said. Her research cohort recommended to the U.S. Centers for Disease Control and Prevention that the federal government start providing mental health and social work resources in shelters, but that still doesn't address the problem of multiple, ongoing trauma, an issue that has yet to be studied for hurricane survivors. "People with two [traumatic] events do much worse than people with only one event. It's understandable, but nobody is thinking about what to do about it," Dr. Taioli said. Dr. Hargett explained that there are many types of responses to trauma: Feeling scared, helpless, anxious, depressed, even guilty—many survivors are plagued with guilt over people who fared worse in a disaster. And there's also anger. "Anger—how many of y'all get angry?" he said, the crowd laughing softly. "There are people that are still mad with God." Trauma and PTSD can be compounded by a long term stigma in many Black communities about accessing mental health services, and by an acute lack of Black therapists and psychiatrists. "Not going to professionals/seeking professional help is linked to historical experiences in the African-American community," Dr. Hargett said. Pastor Anthony Gibson, Dawn's husband and the senior pastor at Peletah, piped up to say his parishioners often think they don't need therapeutic help because they have Jesus. "I say to them, 'well, I can have Jesus and a therapist.'" They've moved to stay with family, but she doesn't want to go back to a flood area—her 5-year-old daughter is now afraid of water. "I'm still having dreams of being in the dirty water, and just thinking about it. It's gotten to the point now where I can't sleep without thinking about it," she said. "As people of color, as Black folk we talk a lot about our resiliency, about our ability to bounce back from disasters, whether that's a natural disaster like Florence, or a human disaster like white supremacy and racism. But what if the traumatic event didn't have to happen?" she said. She argued, and Dr. Hargett nodded agreement, that this is a sort of "toxic resiliency"—not actually bouncing back, but adapting to the toxicity of stress and repeated trauma in the body in ways that are actually damaging. "It's become this weird compliment-not-compliment about how strong we are as a people. Folks become numb to our pain, because we always experience pain, and we bounce back," Burney-Scott said. "Someone can be standing in front of me and I'm bleeding out and they say it's okay, you'll be resilient, you'll bounce back. But people are dead because trauma killed them." "We have a lot of parents who are coming to us now saying, I need my child there, because they were rescued out of the water and they're having nightmares and when it starts to rain you can see them tensing up," Gibson said. Her students can be triggered into a trauma reaction by rain itself, and some are living long-term with family or friends. "Every single child has been impacted." "That to me is going to be the public health issue number one," she said. Many people have allergic reactions to mold, and the CDC warns that people with asthma or other respiratory conditions and people with weakened immune systems should stay clear of homes with mold in them, because they can risk infection. The supervisor of environment health for the Craven County Health Department, Keith Jernigan, said the county saw about a 10-fold increase in complaints about mold in the weeks following Hurricane Florence; they had dozens of complaints in a short period of time when normally they would have about two a month. While the department isn't able to help with remediation, it sends out information packets warning about the allergenic and toxic risks of mold exposure, and giving suggestions for safe clean-up. After the event at Peletah, Gibson walked out front. "I tell the kids to take a walk, take breaks," she said. "I guess that's what I really need right now." Lewis Raven Wallace is a journalist and editor based in Durham, North Carolina. His work focuses on people who are economically, geographically, and politically marginalized, and he’s a regular contributor to Scalawag Magazine. His forthcoming book from University of Chicago Press is about the history of “objectivity” in journalism. This is what climate catastrophe looks like. Refusing to be cast as the sad victims of sea-level rise, these Louisiana fishermen are finding ways to adapt and survive. Fossil fuels won’t last forever: How will Houston cope? The risk of a storm surge makes the threat to the industry literal, but market pressures and the possibility of stricter climate legislation—still remote in Texas, but increasingly common worldwide—are already nipping at the industry’s heels.